04:25:00 Makes 6 servings, 1 pop (116 g) each. Makes 6 servings, 1 pop (116 g) each. All the flavour of a pina colada cocktail in an ice-cold pop! 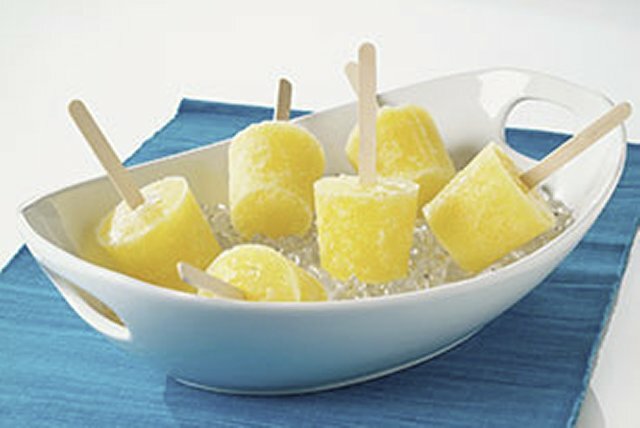 These adults-only frozen Pina Colada Pops feature lemon jelly, rum and crushed pineapple for a warm-weather treat. Add boiling water to jelly powder in medium bowl; stir 2 min. until completely dissolved. Stir in rum. Add enough ice to reserved pineapple liquid to measure 3/4 cup. Add to jelly; stir until slightly thickened. Remove any unmelted ice. Refrigerate 15 min. or until jelly is thickened. Stir in pineapple. Pour into 6 paper or plastic cups. Freeze 1 hour. Insert wooden pop stick or plastic spoon in centre of each cup. Freeze 3 hours or until firm. Remove pops from cups before serving. Freeze in frozen pop molds instead of the cups. Substitute cold water for the rum. Remove frozen pops from freezer about 5 min. before serving; let stand at room temperature to soften slightly. Serving Size Makes 6 servings, 1 pop (116 g) each.